During the Asian session on February 11, AUD is growing moderately within the correction after an indistinct decline at the end of last week. A more confident strengthening of the currency is hampered by the strengthening of USD, which last Friday, received additional support after the Trump administration announced a meeting with Chinese leaders in Beijing. On Monday, there is a lack of key macroeconomic statistics from Australia expected, so investors will continue to rely mainly on data from the United States. In the meantime, moderate support is provided by data from China. In particular, in January, the rate of issued new loans rose sharply from 1080 billion to 2,800 billion CNH. On the daily chart, Bollinger bands are moving horizontally. The price range widens from below, letting the “bears” renew local lows. The MACD indicator is falling, keeping a strong sell signal (the histogram is below the signal line). Stochastic reached its lows and is trying to reverse upwards. 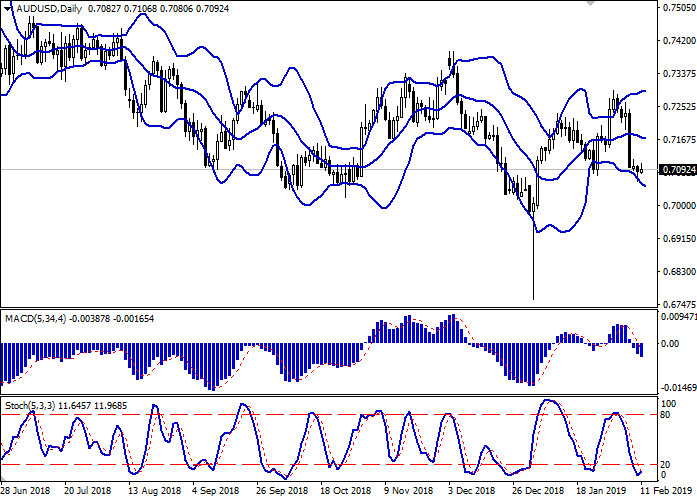 Current indicator readings reflect that AUD is oversold in the short/super short term. It is necessary to wait for the clarification of the trading signals from the technical indicators. Resistance levels: 0.7116, 0.7142, 0.7165, 0.7200. Support levels: 0.7075, 0.7059, 0.7027, 0.7000. Long positions can be opened after the breakout of the level of 0.7116 with the target at 0.7200. Stop loss is 0.7090. Implementation period: 1–2 days. 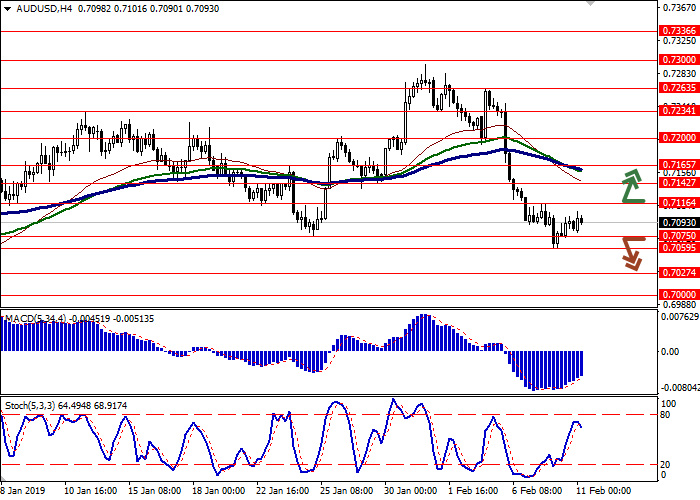 Short positions can be opened after the breakdown of the levels of 0.7075–0.7059 with the target at 0.7000. Stop loss is 0.7100. Implementation period: 2–3 days.